Drinking whisky is fun, of this there is no doubt, but it’s also educational. Getting together for a tasting session is like a mini trip around the world without ever having to leave the comforts of The Barthenon. During our “travels”, we’ve been to Scotland, Ireland, Japan, India, France, Sweden, Tasmania, Canada, many states in the good old U.S. of A. (Kentucky, Texas, Pennsylvania, Washington, Illinois, Indiana, and California just to name a few), and even Thailand (we won’t be going back there any time soon. Next time around, we’ll stick with the Pad Thai and Drunken Noodles. Thai food good! Thai whisky bad. Very very bad!). When it comes to Scotland, we’ve had the good fortune to do some truly extensive booze traveling. We’ve been to Speyside, Orkney, Campbeltown, Islay, and the Isle of Skye, to name just a few, and now, thanks to this wee dram of Ledaig, courtesy of The Exclusive Malts, we’ve now paid a visit to the Isle of Mull. For those of you that aren’t familiar with Ledaig, it is produced at the Tobermory Distillery which is the only working distillery on the Isle of Mull. With youth on its side, this cask demonstrates all that is great about heavily-peated Scotch malt whisky. Taken from a distillery not normally associated with peaty whisky, this cask is full of smoke, seaweed and the smells of the Isle of Mull. A brute of a whisky bottled before time dulled its full powers. Appearance: Very pale yellow color with thick, slow moving legs. Limpd: Almost like a peated Irish whiskey, with lots of heather and maybe a little honeysuckle along with a big blast of peat. G-LO: Sweet peat when you smell it neat. As if there’s any other way to nose a whisky! Once you get past the delightful smoke, some green apple and herbal notes come through, i.e. licorice, rosemary and some menthol. Limpd: Wow! A big blast of smoke followed by leather and licorice and little bit of chili peppers and then some vanilla. Despite the high voltage, the lingering and pleasant finish is almost soft compared to the big flavors in the front. With a little water, the smoke subsides a bit and is replaced with smoked meats and then herbals and then the familiar chiles. G-LO: Wow is right! There’s no slow going with this one. It’s like I just boarded the Rocking Rollercoaster at Disney Hollywood Studios. There’s a healthy hit of alcohol at the onset which is to be expected given this whisky’s 56.7% ABV. Once you get past that, there are some big smoky flavors to start things off. There’s also a jalapeño like spice there too. The smoke drops off a bit at mid palate and those green apple and herbal notes start to come through. While the smoke subsides a bit, the chili pepper heat lingers. At the finish, the spice intensifies again and lingers for a good bit in the aftertaste which is very dry and astringent. Limpd: I’m not as big a fan of the peat as G-LO, but he has dragged me kicking and screaming (ok, so it might be closer to G-LO pouring out a peated whisky and then I drink it) into the world of peat. I have to say that I’m starting to like it. 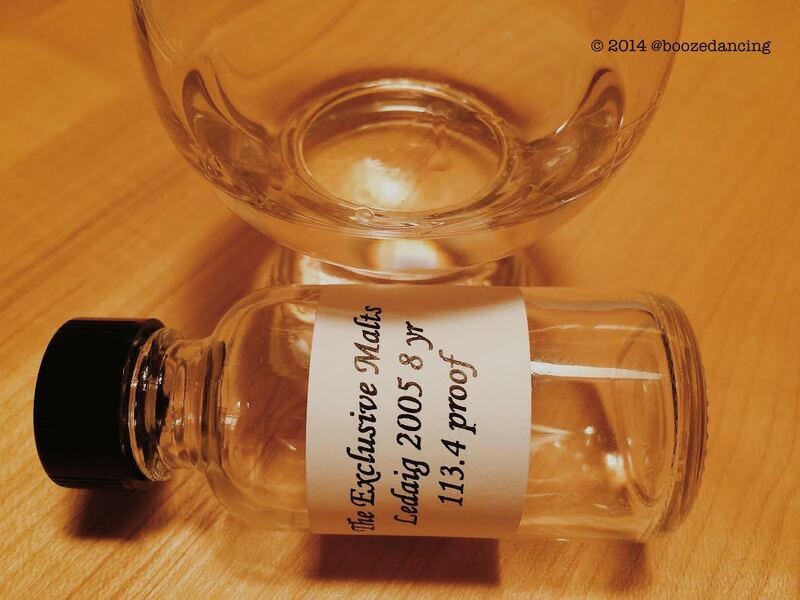 I had had a taste of Ledaig from a SMWS sample (42.10 Straightforward, sweet and spicy) and it left me intrigued. This sample was even better and I think while Islay still scares me a bit, I am growing rather fond of the Isle of Mull and the very nice whisky there. G-LO: It’s good to know that the Islay distilleries don’t have a monopoly on deliciously peaty whisky. I really enjoyed this Ledaig single cask whisky. Much like a younger Islay whisky, it was bold and very in your face (in a nice way of course!). This whisky totally reminds me of a really young Ardbeg or Kilchoman (though a notch or two below them), both of which I enjoy immensely. For a completely different take on this whisky, click here to read what Jordan of the Chemistry of the Cocktail blog had to say about it. Many thanks to the good people at Impex Beverages for supplying us with this very generous sample! great review this time ! thanks for the update….